South Korean director Im Kwon-taek won the San Francisco InternationalFilm Festival's 1998 Akira Kurosawa award for lifetime achievement indirecting -- even though none of his films had been commerciallyreleased in the United States. Then in 2001, after 40 years and 90-plus films, he finally saw one of his works open stateside. Chunhyang was a beautiful if somewhat difficult film that told a centuries-old Romeo and Juliet story accompanied by the traditional Korean p'ansori -- basically a singing narrator and a drummer. Even so, audiences apparently liked it enough that Im's newest film, Chihwaseon, has also been picked up for distribution. 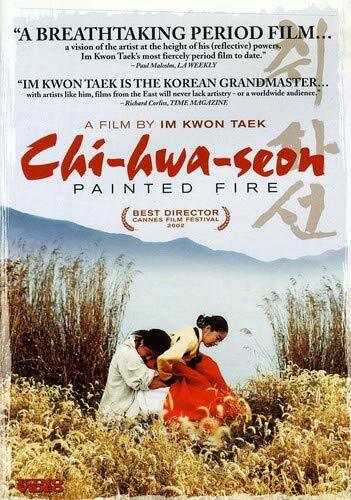 Chihwaseon -- also known as Painted Fire or Strokes of Fire -- isn't nearly as accomplished or sublime as Chunhyang, but it has enough beauty of its own to make it worth a big-screen viewing. Essentially the same movie as Julie Taymor's Frida, Chihwaseon tells the life story of a famous 19th-century Korean artist. It contains many great and beautiful passages, but the overall effect is too fast and basic. As in Frida, we get more of an idea of what the artist did rather than who he or she was. Also like Frida, Im's film allows for a bravura centerpiece performance -- this one by actor Choi Min-Sik as the drunken, womanizing, self-obsessed but brilliant artist. Jang Seung-Ub, also known as "Ohwon," is an outsider, a lower-class artist who teaches himself through raw perseverance and talent, while all other Korean artists rely on their upper-class upbringing. Ohwon paints with passion, while they paint with training. When a Japanese nobleman commissions a painting, he asks Ohwon how he achieved such high standing from such low beginnings. So begins the crash course in Ohwon's life. In the beginning, a man named Kim Byung-moon (Ahn Sung-ki) saves the young Ohwon from a beating in the street. The young boy draws him a picture by way of thanks, and Kim takes him on as an apprentice. In fits and starts, we see Ohwon variously working with his own young apprentice, going through women like they were toilet paper, drinking a lot, avoiding the volatile politics of the time and of course, painting. Choi does a glorious job of showing the act of creating through painting. We not only witness his finished product, but also the beauty of the strokes as they happen. And the dialogue beautifully describes the finished pieces and what makes them work. At one point, a fan asks Ohwan to verify the authenticity of one of his works. Ohwon glances at it and dismisses it as a fake. Later, he explains that it really was his painting, but it was meant as a gift. The recipient obviously sold it; therefore, it's now a fake. That's one of the film's fleeting moments of greatness. If only Chihwaseon had not bothered with all the historical and autobiographical details and simply concentrated on the person and the art -- done something like H.G. Clouzot's The Mystery of Picasso or Jacques Rivette's La Belle Noiseuse -- we might have had something.